Let us take a look today at the latest in the 40 Questions series from Kregel Academic. This one is 40 Questions about Church Membership and Discipline, and it’s by Jeremy M. Kimble. Kimble is an assistant professor at Cedarville College, and his background is Baptist. Southern Baptist, if you’d like to be precise. 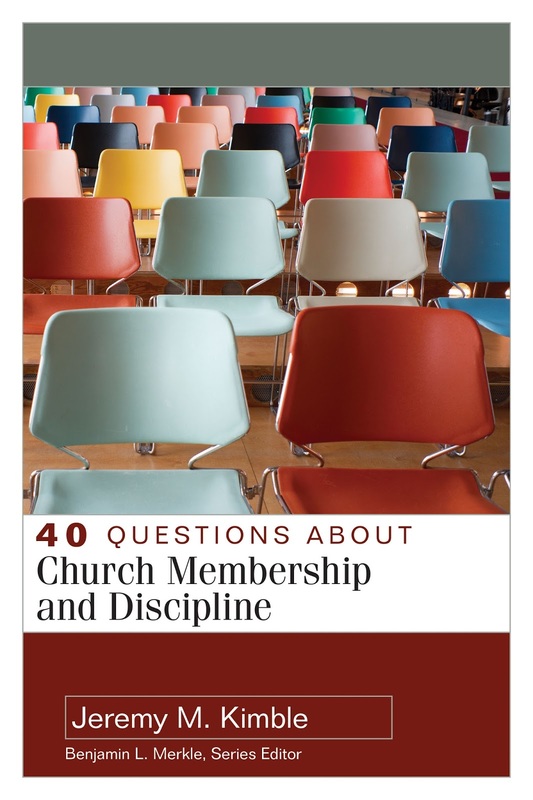 40 Questions about Church Membership and Discipline (40QaCMaD) is 272 pages, trade paperback size, and all text. It is published by Kregel Academic, and the series editor for the 40 Questions series is Benjamin L. Merkle. I personally own several entries in this series and have appreciated all of them. On to 40QaCMaD: First, the overall format of questions/answers is a good way to explore a topic. The primary drawback is that the same person provides the questions and the answers. That means the author is never stumped by a question and gets to dodge the troublesome ones. Which, unfortunately, does happen in this work. I’ll start with the drawback, the missing questions, and then end on the positives. The missing questions deal with protecting against abuse in a church discipline system. While not advocating an excessive discipline, it is a legitimate question to ask: How does a church prevent its disciplinary system from becoming a tool of abuse? No guardrails are suggested, and in fact, the chapter on why some churches do not practice discipline seems to acknowledge and then dismiss the concern of abuse. That being said, this book is still a valuable tool for understanding church membership. First, note that Kimble, the author, and Merkle, the editor, are Baptists. The assumptions underlying church membership and discipline include congregational involvement and independent local churches. Keep that in mind if you’re inclined toward a hierarchal church structure. The opening half of the book is focused on church membership. The 20 questions involved cover everything from qualifications to benefits to responsibilities of church members. These are good, though brief. Keep in mind that whole papers and books are written about subjects such as what age a child should be a church member. The second half, of course, then deals with discipline. This is also good and deals well with practical ideas about keeping the church on-course through discipline. It also deals with the specific question of handling church leaders who need discipline. As with all books, the presence of footnotes is pleasing to the eye, so that I’m not flipping around trying to find the references. In all, a useful guidebook for those considering what church membership should mean and how that relates to church discipline.